Transfer files among devices (iPhone, Android, Computer) with a "Bump"
If we look back to how we used to share files among various devices, infrared was one of the first means of data transmission. Then came bluetooth, a technology that allows us to communicate among devices within a short range and transfer files among them. Wi-Fi works similar to Bluetooth but for a longer range and at faster speeds. The latest file sharing technology in mobile devices implements Near Field Communication (NFC). Usually found in most high-end mobile devices, NFC allows two supported devices to share files by just tapping them together; but it cannot share files with a non-NFC device. Bump is an innovative app, available on both iOS and Android, that allows you to transfer files between two devices by bumping two devices together. The file transfer process is similar to an NFC transfer, only it works on non-NFC equipped devices too. Initially, Bump only supported contact sharing among its users,. Later on, the app was upgraded to include photos, music, video and other types of files too. Earlier, it used to be difficult to transfer files among mobile devices. Even now with Bluetooth, file transfers involving an iOS device is especially difficult since it does not support data exchange with non-iOS devices. Bump overcomes this limitation. It’s a cross-platform app for iOS, Android and Web. So your file will be transferred as long as both the devices are connected to the Internet and the transfer is initiated with the “bump”. To transfer files using Bump, four key factors are important. Both devices should be connected to internet. Bump application should be open on both of them. For file transfer to initiate, both devices should knock together. The devices should share the same location. Internet: Unlike other close range file transfer mechanisms, Bump uses internet connectivity to communicate with devices. Now, this might seem as a disadvantage for many users but, to think it in another way, after all, what’s a smartphone without Internet. The Application: For successful communication between two target devices, the Bump app should be open on both of them. If one of the devices involved is a computer, it should have the Bump website open in a browser. The sender selects the files to transfer from within the app and the receiver has to accept the transfer within the app. Bumping together: This is the most important factor for Bump to establish connection among devices. The app uses the device’s accelerometer/gyroscope to detect sudden motion like shakes, in the devices. When two nearby devices vibrate at the same time and have the application open, a connection is established between them. The receiver can now start receiving data from the sender device. When a computer is involved in a Bump transfer, the tapping of the spacebar is monitored instead of shake sensors. Note: It isn’t necessary to physically bump the two devices to initiate a file transfer, it’s just the typical shake of your device that initiates file transfers. You can actually transfer files from one device to the other by keeping the app open on both the devices and just shaking them together. Whenever Bump registers a shake (on mobile devices) or a spacebar hit (on computers), it triggers a search for any other nearby device has also registered a simultaneous bump. Once the right candidate is located, the connection is established between them. The app then requests the receiver to allow the file transfer to initiate. Once the permission is approved, the file is transmitted to the receiver. Location: With thousands of active users, Bump monitors millions of “bumps” from around the world. To ensure that a particular user does not connect to other users unintentionally, the app accesses your location and searches for a simultaneous bump only within your range, and connects to the device. 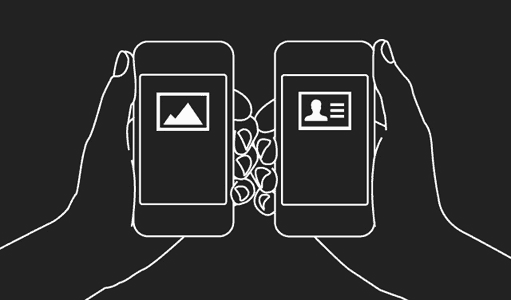 Bump lets you to seamlessly transfer files between an iOS device and an Android device. This works as an alternative way to transfer files when Bluetooth file transfer isn’t possible. 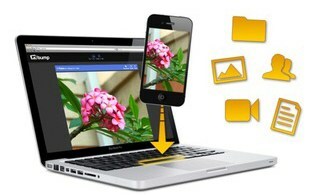 This feature will help iOS users to share files with Android devices too. The files transferred from one user to the other using Bump are saved on their servers. Bump is more popular as a photo sharing app. Bump uses their own servers to store files being bumped by the users. The sender’s app will upload the files being shared to Bump’s servers, while the receiver gets the download link and begins downloading the files. Additionally, the company also has a social network they call “flock”. Flock allows users to upload and share photos with friends. Install Bump from Google Play (Android) and App Store (iOS). The app has access to media files (iOS) and also Apps (Android) on your device. Select the individual files you want to send to the recipient. Bump the two devices together. On the receiving end, tap on Connect to setup the connection. The receiver will now automatically download the sent file. For computer, access the web version(bu.mp) of the app to send and receive files across devices.